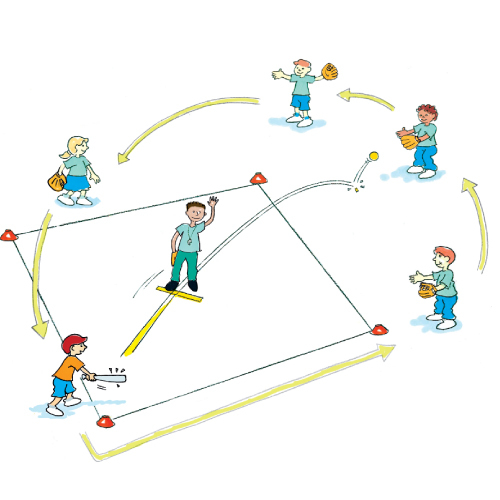 Progressive coach pitch is a modified game of softball that builds on striking and fielding skills and encourages teamwork and thoughtful placement of the ball. Coach pitch introduces the skill of hitting a pitched ball. Players play as 1 team and take it in turns to bat the ball, which is pitched underarm by the coach. The batter attempts to run around the bases while the rest of the players field the ball. Once a player goes out, they pick up a glove and join the fielding team at right field and the remaining fielders rotate one place. Where is the best place to stand to stop the ball?